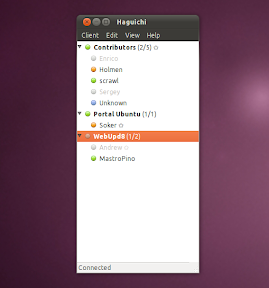 Hamachi is a zero-configuration virtual private network (VPN) application capable of establishing direct links between computers that are behind NAT firewalls without requiring reconfiguration (in most cases); in other words, it establishes a connection over the Internet that emulates the connection that would exist if the computers were connected over a local area network. Haguichi provides a graphical frontend for Hamachi on Linux that integrates smoothly into your GNOME desktop. Important: Once you install Hamachi2, you'll have to log out and log back it or else Haguichi will not be able to connect to Hamachi2. Once you've installed both Hamachi2 and Haguichi, you can finally open Haguichi by going to Applications > Internet > Haguichi.